Prime Minister Dean Barrow will be leaving over the weekend for medical treatment in the United States, but this morning, he faced a firestorm in respect of the recent passport and visa scandals that have rocked the Ministry of Immigration and Nationality and have shaken his Administration to the core. 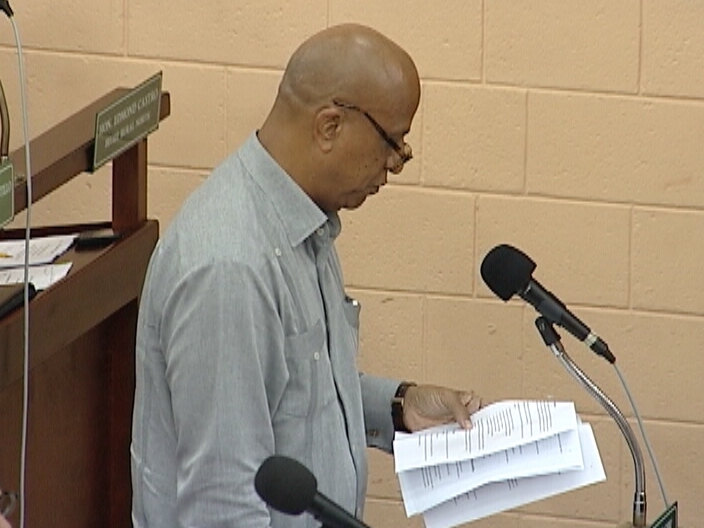 A number of bills came up, but the scandals took centre stage this morning when the House of Representatives met in Belmopan with both sides throwing jabs at each other over the issue. We start with the introduction of three bills to amend the Immigration Act as it pertains to passport and visa controls. The three amendments, including the Immigration Amendment Bill, the Belizean Nationality Amendment Bill and the Passport Amendment Bill were tabled in the wake of the passport scandal involving former Minister of State Elvin Penner and there is the allegation of a visa hustle involving the minister of state, Edmund Castro. The measures, according to Prime Minister Dean Barrow, are an effort to improve the existing system in order to make it as foolproof as possible. To do so, a committee will be established to vet the issuance of permanent residency permits. you are a joke. Your meds have taken your mind. Little too late. You might have been able to stave off the collapse of your government if you had pushed for a bipartisan national inquiry. But your ship of rats is sinking, and soon they will be wanting to cut deals to avoid prison. Fortunately for you, medical care in Hattieville is the finest in the world, convalescence will give you plenty of time for rehab. You and your thieving ministers need to go judas barrow guan guan you all must be locked up in jail for treason . He is leaving for the US to seek treatment again. He does not even trust the doctors in Belize to treat him. The poor people who need decent medical care either cure themselves or die because they cannot afford to get to the US. It has been a pattern that whenever there is a crisis in the country the PM bails out of the country and goes to the US. So glad the people are sending a message. Why is he coming to the U.S. for treatment? he should go to K.H.M.H. if he believe in them, but again that place is for poor people and they use it as a slaughter house and a place where they practice. This will intern make it easier for the next GOB to hustle. They will put there poised and most trusted people as CEO’s to be in that committee headed by the Minister then to do the dealings better.